A wonderful dish for Sunday lunch. 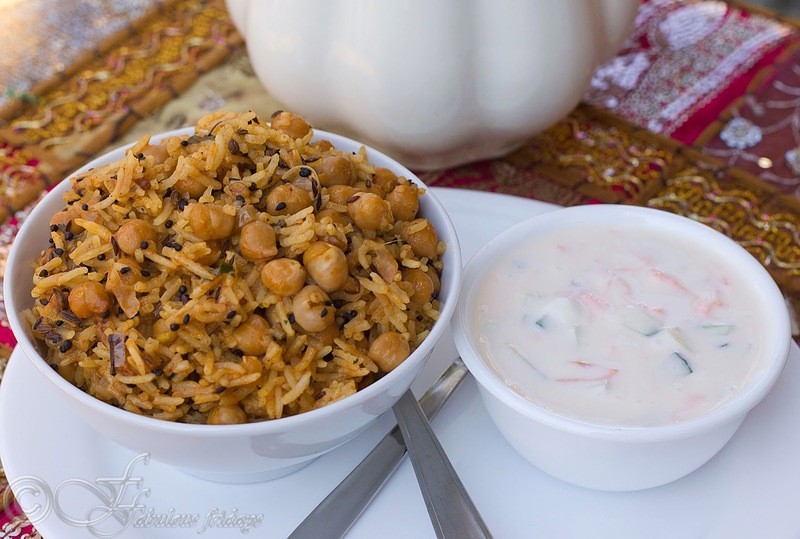 This one pot meal is sure to be a hit around the table as it combines the earthiness of chickpeas with the rich vibrancy of achari (pickle) flavors. Addition of fennel and nigella seeds adds the pickle like taste while the bay leaves, cloves and cinnamon add the pulao flavors. Serve with a refreshing mixed salad raita and a crunchy papad. Wash and soak rice in 4 cups cold water. In a large pan heat oil and add bay leaves, fennel, mustard, kalonji, cumin, methi, cloves and cinnamon. Roast for about 10 seconds and add the sliced onions. Stir fry till pink and add the garlic paste. Cook till onions become golden brown and then add the ginger and cooked chick peas. Cook to incorporate the spices into the chickpeas for 2 minutes. Add the whisked yogurt along with all the spice powders and cook till oil separates from the sides. Drain the soaked rice and reserve the water. Add the rice as a layer on top of the curried chickpeas, sprinkle a little bit of salt and mint and coriander leaves on top. Add the reserved water gently without disturbing the layers . Do not stir. Cook on high till the water starts to boil. Do not stir. Reduce heat to a simmer and cover. Cook on low heat till the rice is fully cooked and all the water evaporates. Gently mix to evenly distribute the chickpeas. Remove from heat and let the pan stand covered for 10 minutes before serving. Serve with mixed veggie raita. 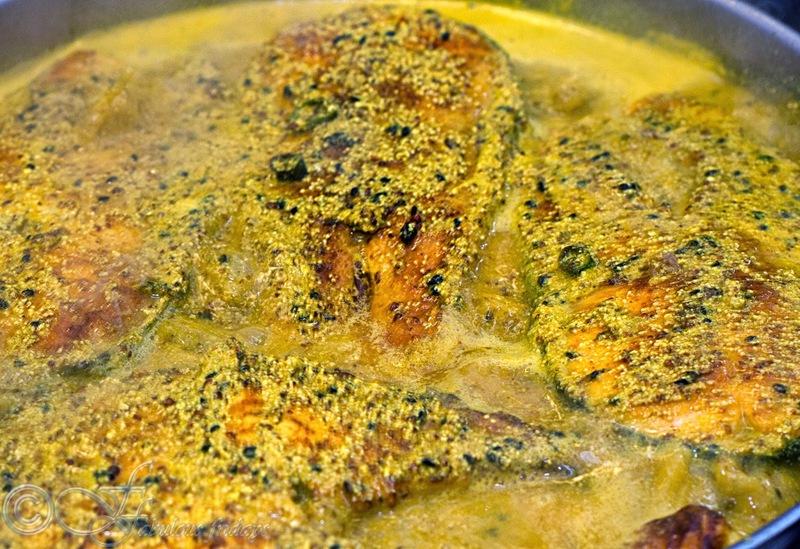 Shorshe maach or the Bengali mustard fish curry is fish cooked in mustard paste. It can be of thick or thin consistency depending on the fish variety used. Thinner version of macher jhal is best served with plain white rice, whereas for the drier variation, roti is an option. 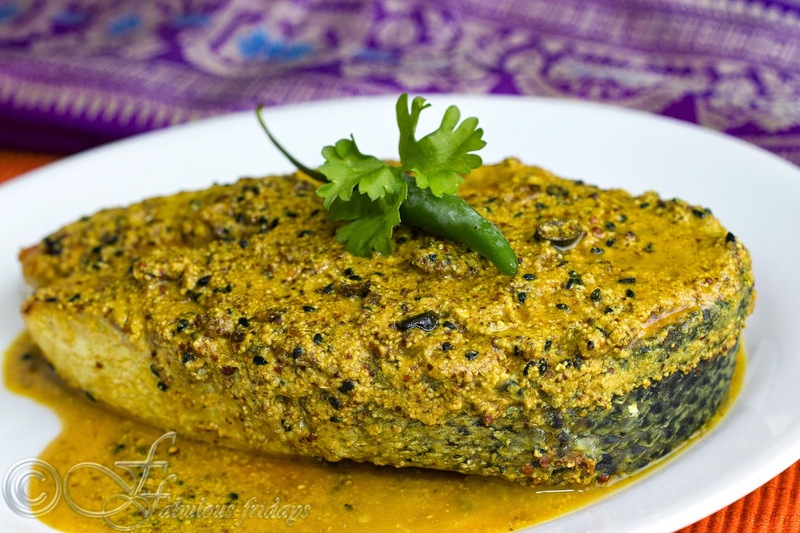 This recipe is best suited for Rohu fish, but any firm fleshed fish can be used which will stand up to frying. I have used whole salmon steaks. You can cut them into four pieces if you like. Serve with rice and dal. Soak mustard and poppy seeds in water overnight. Add green chilies and grind to make a smooth paste. Keep aside. Rub the fish with little salt and turmeric powder and keep it aside. In a pan heat oil till it smokes. Deep fry the fish pieces for 2-3 minutes or till golden. Drain and keeps aside. Add the nigella seeds. Pour in the mustard paste, turmeric, red chili powder and water. Add the slit green chilies and bring it to boil. Add the fried fish, simmer the heat, cover and cook for 5 minutes. Uncover, adjust the consistency and salt. This Mughlai delicacy is rich and creamy, and is cooked in aromatic spices and almond paste to get a delicately flavored chicken curry. 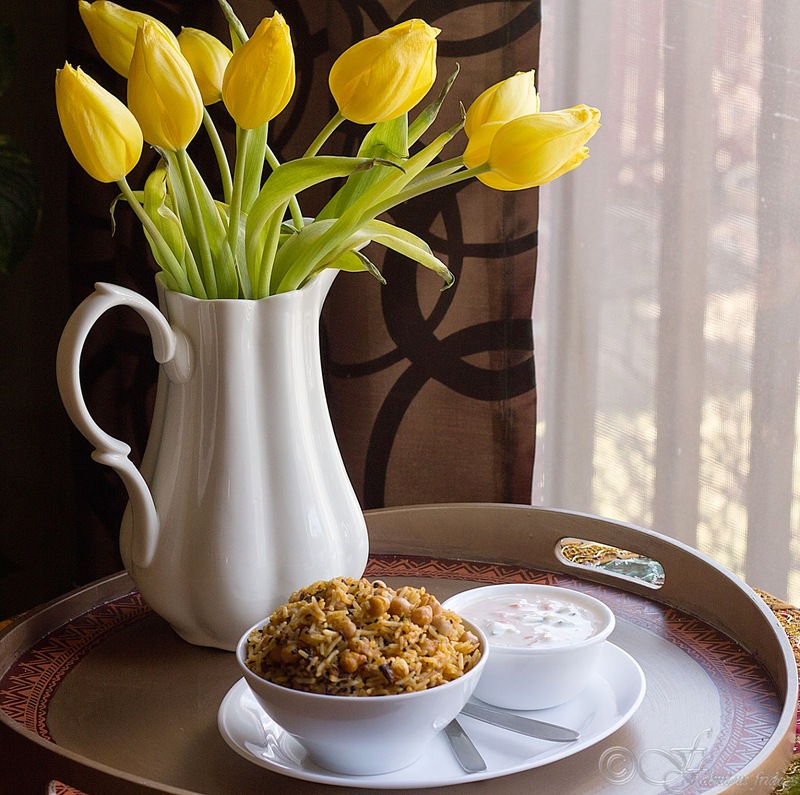 Serve with naan or rice for a royal feast. Marinate chicken with salt and red chili powder for at least 2 hours. 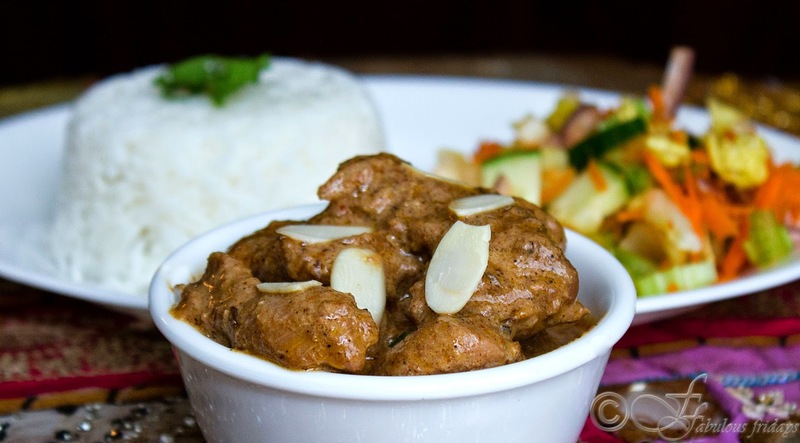 Take ginger, garlic, 15 almonds and 15 cashews in a grinder and add just enough water to make a fine paste. Keep aside. Lightly toast the rest of the almonds and cashews and raisins in a tsp oil and keep aside for garnish. Take cloves, cinnamon, green and black cardamom and pound them lightly to coarsely grind these. Make sure they don't become a fine powder. Keep aside. Heat oil in a pan and shallow fry the chicken pieces till they are golden in color. Don't worry if they do not cook through fully, we will be cooking them more later. Make sure to do this in batches so as to not over crowd the pan. Keep them aside. In the same pan and oil add the pounded spice mixture and bay leaves. Cook for 20 seconds and then add chopped onions. Fry for 3-5 minutes stirring constantly till they turn lightly golden. Add almond paste and Kashmiri chili powder, cumin and coriander powder and turmeric. Stir together for 2-3 minutes till the garlic cooks a bit and the oil separates. Now add the yogurt and stir for 2-3 minutes again till the oil separates. Throw in the fried chicken pieces now and coat them well with the mixture. Add sour cream and salt and some water. Water quantity will depend on the desired consistency of the final dish. Add 3/4 to a cup of water first and stir to see if you will need more. Bring to a boil and them simmer covered for 12-15 minutes till chicken is cooked through and gets the full flavor of the gravy. Make sure to check on this every so often as it can burn easily due to the cream and yogurt. Add garam masala and serve topped with toasted nuts and raisins and fresh coriander along side naan or rice. 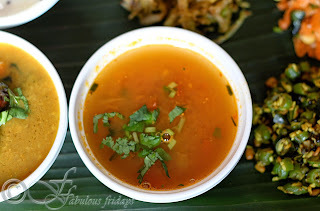 Saaru or rasam as it is more commonly known as a soup prepared with tamarind or tomato as the base. Seasoned with various spices and with the addition of lentils it has a distinct aroma and taste. Rasam can be served with rice or as a soup separately as a starter. A yumilicious treat indeed. 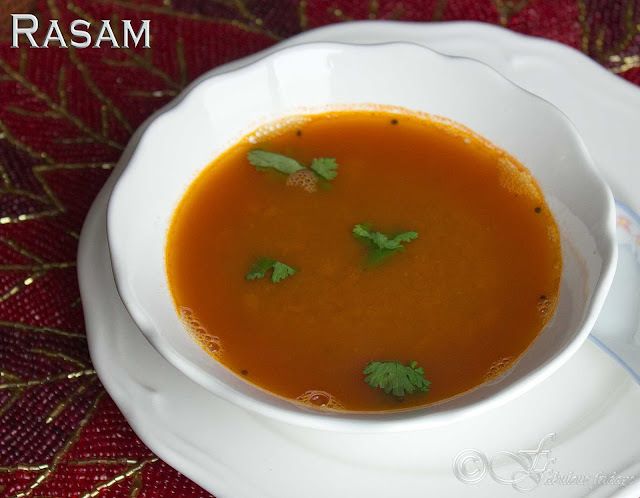 There are several ways to prepare rasam, this one here is tomato based. Mash the cooked dal and keep aside. Soak tamarind in warm water and extract its juice, keep aside. Dry roast and grind all the stuff under the rasam powder heading, keep aside. Chop two tomatoes fine and puree the other two, keep aside. In a saucepan combine chopped tomatoes, tamarind juice, salt, turmeric powder, curry leaves and pinch hing and bring to a rolling boil. Add the pureed tomatoes and 1/2 cup water and boil till the raw tomato smell is gone. Now add mashed dal, 3 cups water, and the ground spice powder. Boil till the mixture froths up, about 3-5 minutes. Taste and adjust salt. Temper with mustard seeds and serve hot sprinkled with freshly chopped coriander. Chittra anna is lemon fried rice. 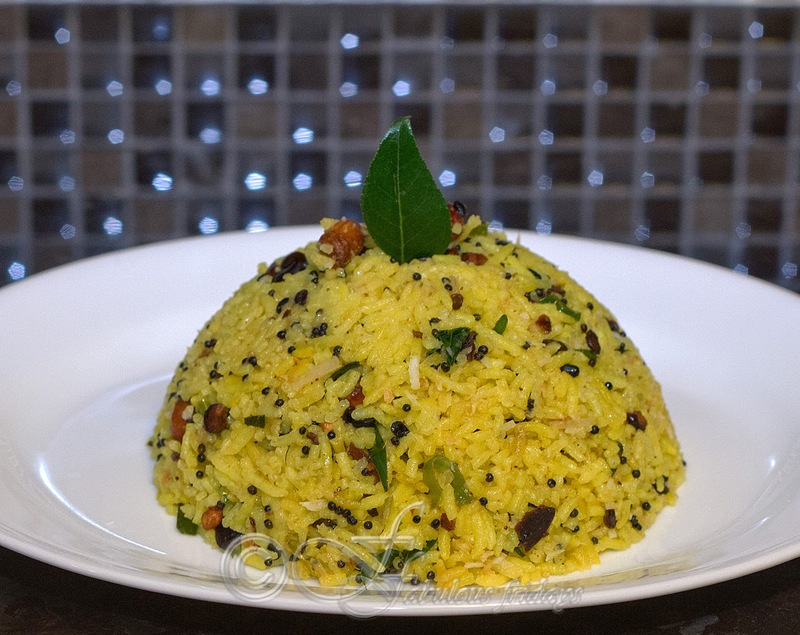 Also called Nimbekai Chitranna in Kannada it is the most commonly prepared rice dish in Karnataka. 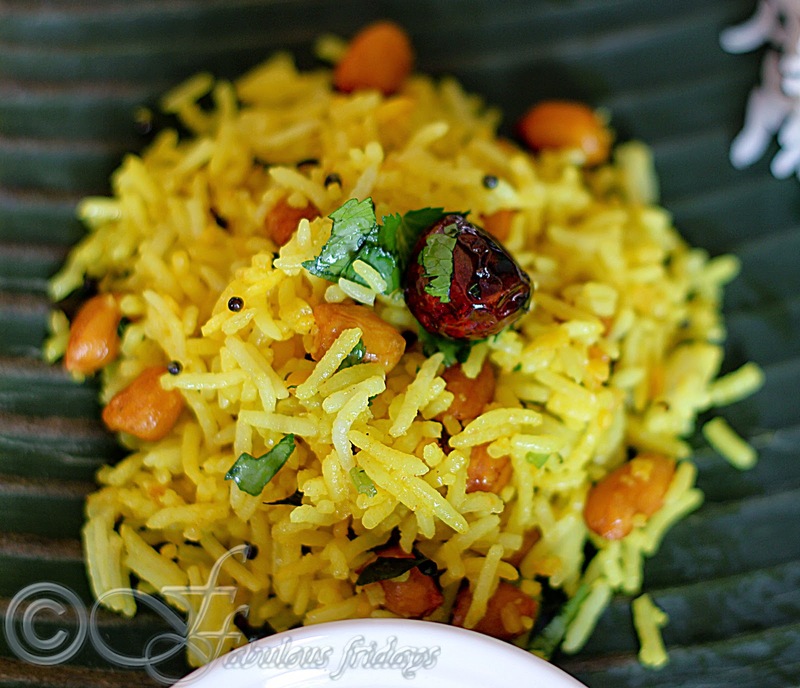 The rice is yellow from turmeric and flavored with lemon, fried peanuts and spices. 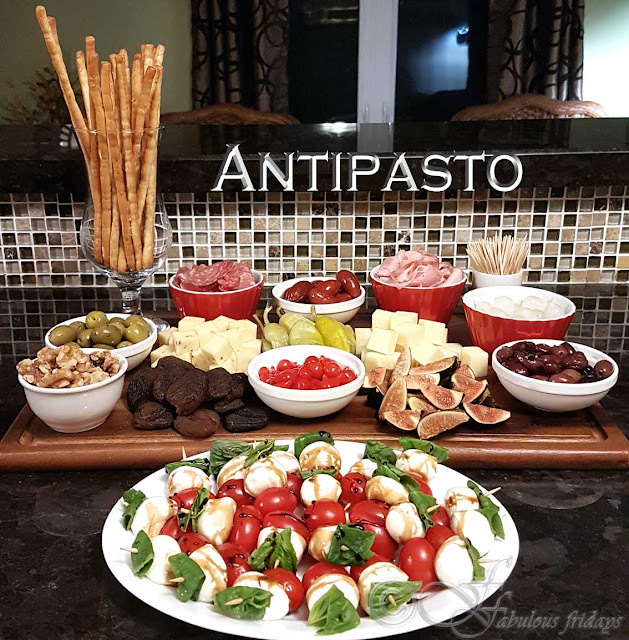 Since it is so colorful it is often made for special occasions or festivals. Serve with raita, green beans palya or lentil stews like sambar or rasam. 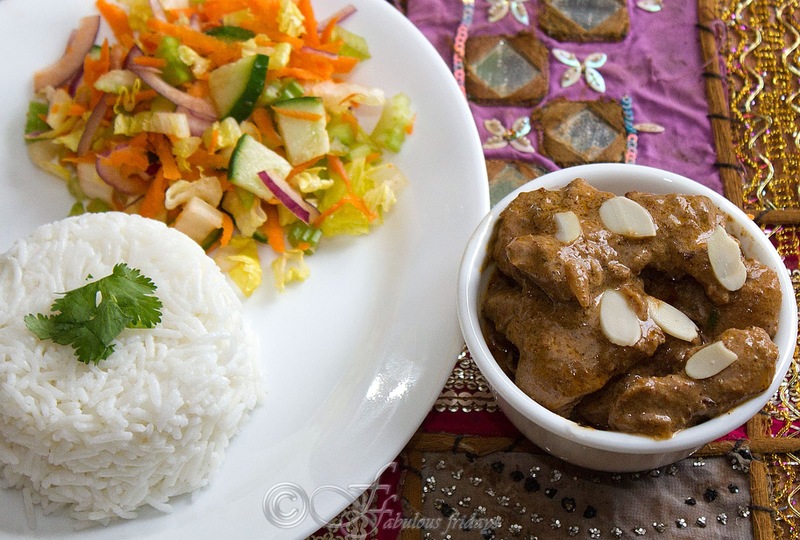 For good results always advisable to use steamed rice cooked a few hours in advance. Fluff with a fork to ensure all grains are separate. In a large pan heat oil and add mustard seeds. Let them roast for 5-7 seconds, then add hing, urad dal, peanuts and whole red chilies. Roast till dal turns golden. Add the rice, green chilies and ginger and stir to combine. Keeping the heat at medium, add salt, turmeric and chili powder. Saute well to combine everything for about 3-4 minutes. Finally add the lemon juice as per taste and adjust any seasoning. Serve hot.